LOS ANGELES — Six months ago, Florida dealer Earl Stewart had 135 customers on a waiting list to buy a Toyota Prius. Now he is running ads offering discounts of up to $2,000 on the not-so-hot hybrid. One of the largest sellers of Priuses in the country, Earl Stewart Toyota in North Palm Beach now has about 70 on the lot that it can't get rid of. "Any kind of Prius anybody wants — any color, any anything — I've got it," Stewart says. "And if I don't have it I can get it because there are several hundred in the port. Dealers don't want them." Prius sales of 7,859 units in December were just over a third of what they were last April, but that's not Toyota's only problem. The brand broke through as the industry's top seller in 2008, beating Chevrolet and Ford for the first time. Yet sales were down 14.7 percent for the year and plunged 36.7 percent in December. Toyota fell behind Chevrolet and Ford for the month and was the only one of the top-five selling brands to lose market share. So after a 0 percent financing program failed last fall, Toyota is now preparing to pump money into consumer rebates. "Toyota was riding high with the high-mileage cars," Stewart says. "We were thriving on fuel efficiency. Then the economy got worse and suddenly our advantage vanished even more because of low gas prices." The Prius was down 44.7 percent in December, but it was in the truck categories that Toyota really came up short. The 4Runner, Highlander and Tundra all were down about 50 percent compared with December 2007. "The Tundra remains a question mark and is not improving its share of the segment," said J.D. Power analyst Tom Libby. "On mid-sized crossovers, where Toyota had a head start with the Highlander, there is now a lot more competition." But Toyota also struggled to sell passenger cars because of the fall in gasoline prices, said Jim Lentz, president of Toyota Motor Sales U.S.A. Inc., during a Jan. 5 conference call with reporters. "We saw not only hybrids, but we saw subcompacts and compact cars also fall as a result of that," he said. Toyota launched a major marketing effort in October that touted 0 percent financing, low annual percentage rates, subvented leases and credit access through its captive finance company. Results were disappointing, so now Lentz said Toyota will focus most of its marketing dollars on consumer rebates. "The shift that you'll see in January from December is more consumer cash and less APR and lease support through our dealers," Lentz said. He did not elaborate on the new incentive plan. According to Edmunds.com, Toyota had the biggest percentage boost in incentive spending in December at an average $1,995 per sale. That was up 87 percent from what the brand spent in December 2007. "Toyota is testing the waters now," said Jessica Caldwell, an Edmunds.com analyst. "Zero percent did not resonate. They're trying to find something to work for them." Lentz would not project sales numbers for Toyota, but he is banking on the introduction of a redesigned Prius this spring. "The big challenge has been California," he said. California sales declined more than any other state in 2008. Registrations were down 20.1 percent through October, according to AutoCount, a division of Experian Automotive. Nationwide, registrations fell 12.0 percent in that period. The Los Angeles region alone accounts for about 10 percent of Toyota's total sales. 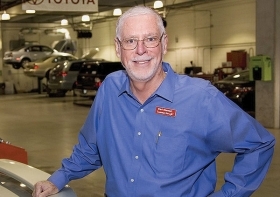 L.A. dealer Dave Conant thinks consumer cash may be beneficial. "It will give customers more money to put down," he said. "All of the banks are requiring money down." Adds Fritz Hitchcock, another L.A. dealer: "I think consumer rebates are good, as long as they don't do it forever." Meanwhile, dealer Stewart, who sold more than 4,000 new Toyotas in 2007 and 3,047 in 2008, says "if we sell 3,000 in 2009 we'll be lucky." And he says he needs plenty of Toyota help to do it. "If Toyota believes that Prius is their bread and butter car of the future, they need to put more money on them," Stewart says. "I'm doing it by discounting mine by $2,000. But I could use some factory help on that."